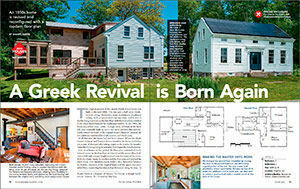 BEST REMODEL: Shawn Harris and the team at Sixteen On Center take this year’s Best Remodel Award for their work rehabilitating, reworking, and revitalizing this Greek-revival cottage in Tiverton, R.I. Outside, the design/build team stayed true to the original home’s traditional style while distinguishing the backside additions with a more modern aesthetic. 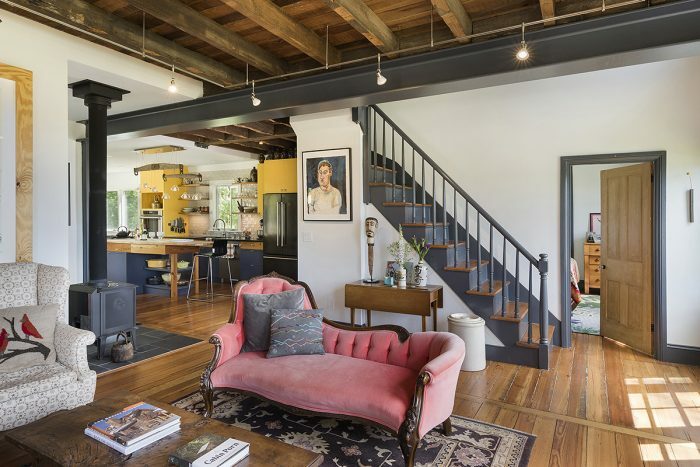 Inside, they created a livable and comfortable open floor plan with eclectic and honest details. 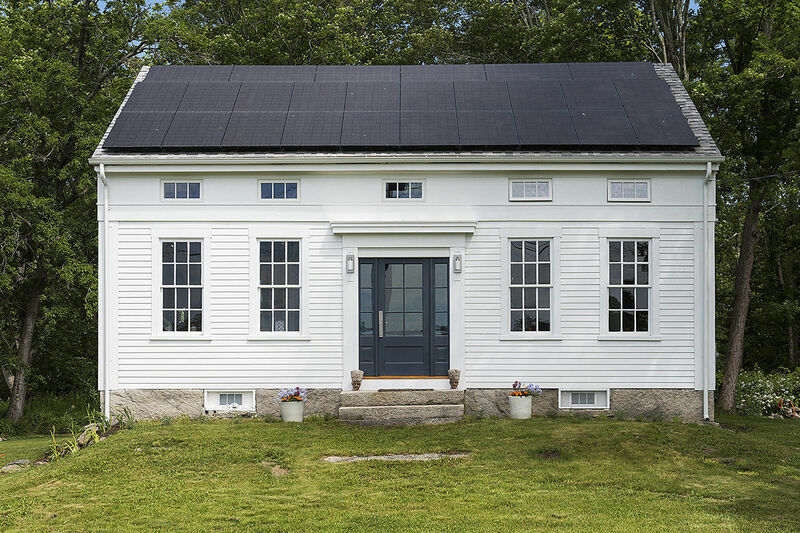 This modest Rhode Island home was built in the mid 1800s. 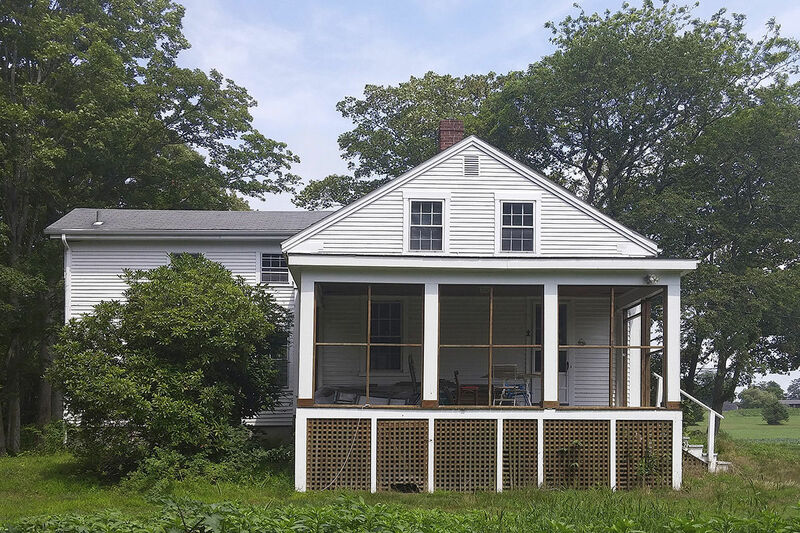 The original one-and-a-half-story Greek-revival cottage was full of old New England charm that included a stone foundation, clapboard siding, well-proportioned exterior trim, and 6-over-6 double-hung windows on the first floor with fixed windows installed in the frieze board beneath the traditional roofline. In the 1900s, the house was added onto, twice. 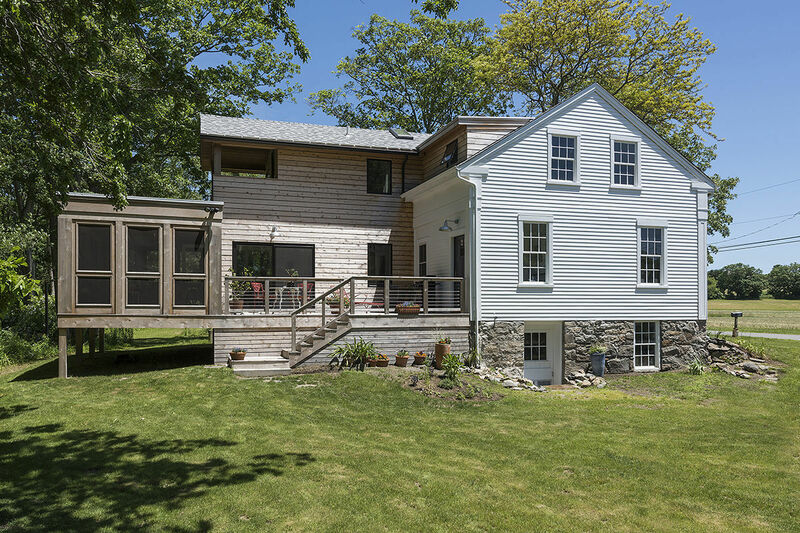 A single-story addition on the backside was eventually built up into a two-story addition that unfortunately missed the mark of the original home’s character. Instead, the two additions combined for a tall, narrow, and bland mass. 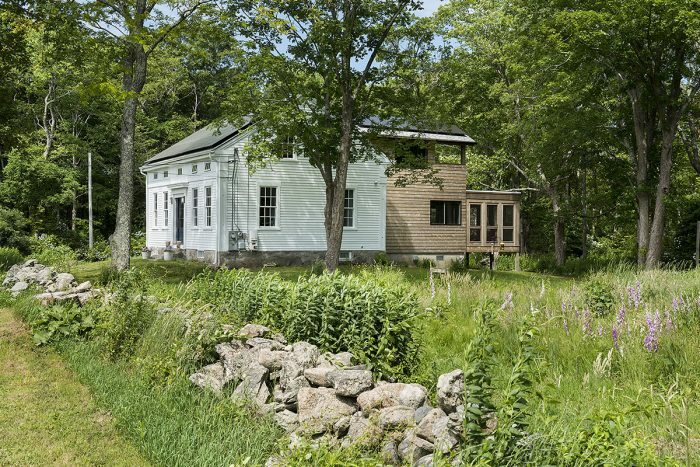 Our goal was to keep the 2200-sq.-ft. original house as intact as possible. With this in mind, we didn’t change the south-facing front elevation or the east-facing side elevation at all. We removed the screened porch on the west-facing side of the house and replaced a doorway with an original window that we relocated from the back of the house. Where needed, we repaired existing windows with antique glass and built new storm windows to add a greater level of energy efficiency. We did replace the fixed second-story windows with new operable units from Marvin. We changed the siding on the additions to knotty red cedar and used black casement and awning windows from Integrity instead of the traditional double-hung windows. 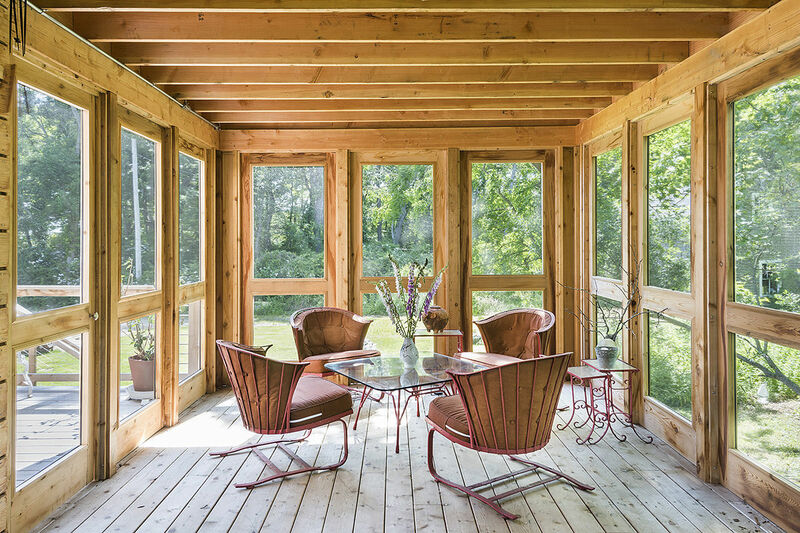 There is no trim around the windows or doors, the deck has a cable railing system, and the new screened porch has a flat roof, giving these elements a more modern look. The new screened porch has more privacy and enjoys views into the adjacent bird sanctuary. It is designed around standard screened doors, inserted between the framing for an efficient and affordable design/build solution. The homeowners wanted to add solar electric panels to a barn in the back of the property, but an analysis of shading from nearby trees showed it to be an ineffective location for the array. Instead, they decided to put the panels on the front roof of the house. The panels and the dormer on the backside are the only major alterations to the exterior of the original home. This house was not designed to be a net-zero-energy home. We made the energy improvements we could along the way, which included adding closed-cell spray foam in all of the walls and the roof to put the maximum R-value into the space available. 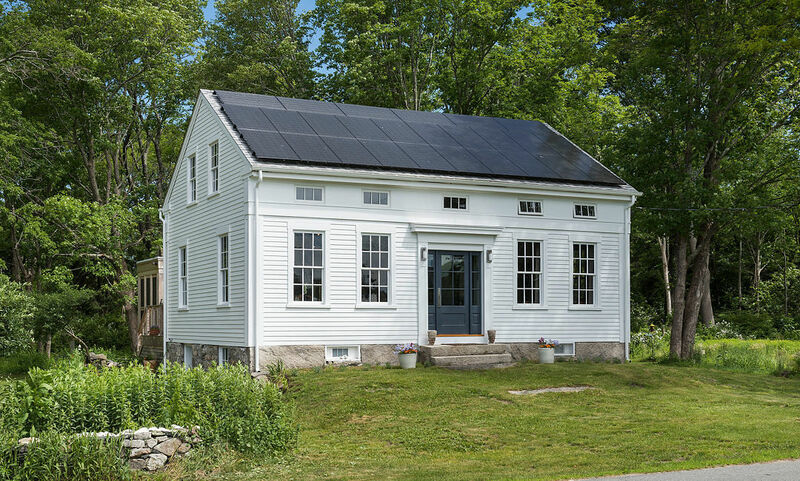 Given the solar install, the homeowners wanted to stay away from fossil-fuel heat sources, and wall-mounted minisplit heat pumps didn’t appeal to them. 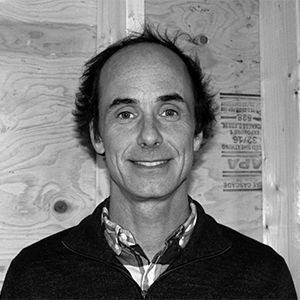 We decided to go with all-electric heating and worked with the folks at Runtal Radiators to spec the required baseboard heating units for the house. One surprising benefit of the electric heating system is that we didn’t have to find space for bulky heating equipment and ducts. Like most Colonial-era homes, the original house was modestly sized with small rooms and a significant amount of space wasted on hallways. The first-floor and second-floor bedrooms were barely usable because there was only enough head height to stand near the center of the room. With the input of the homeowners, Daniel Heyman and Vincent Renou, we went to work with the goal of modernizing the floor plan and updating the entire house. 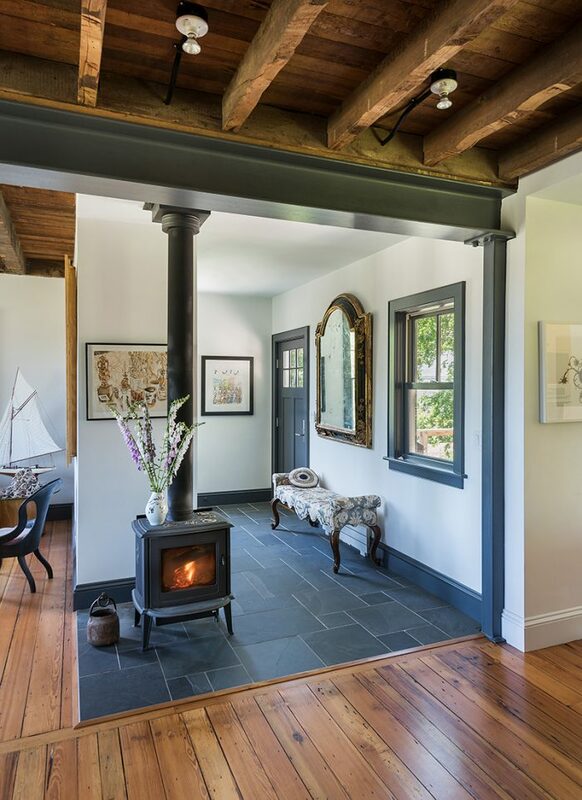 Our intentions were to make a clear distinction between the historic character of the original home and the spaces that had been added later, improving function and performance along the way. Like many remodels, making this home work better meant finding a way to connect the kitchen to the main living area. To do this, we made two big changes: The first was to remove two masonry chimneys, giving us more flexibility with the rooms on both floors. 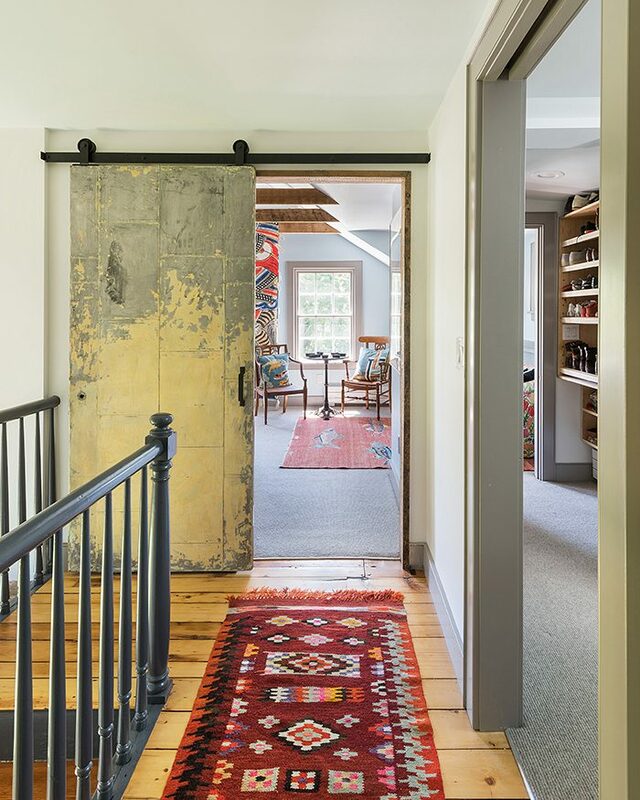 The second was to open up the load-bearing wall between the original entry and living room. With the chimney gone from the living room, we removed the wall that had defined the original din-ing room and turned this space at the back of the house into a mudroom to store all of the homeowners’ outdoor gear. This move also opened up space for a centrally located woodstove, and we transformed the other side of the entry into a decent-size bedroom. With our mechanical plan making the utility room unnecessary, we were able to add a spacious full bath to the first floor, with access from both the public kitchen space and the private bedroom. 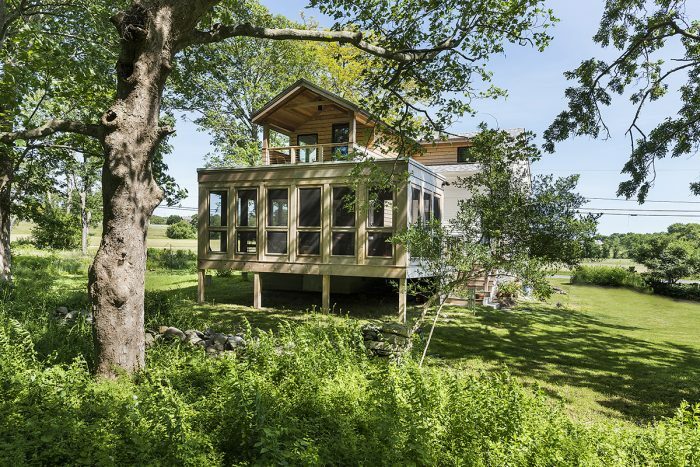 As the design evolved, Daniel and Vincent kept asking us to make the opening created by removing the wall longer and longer, until it became necessary to use steel to span the entire 24-ft. depth of the house. The I-beam bears on the foundation at the front and back of the house and needs no intermediate posts, which made designing the interior spaces significantly more flexible. 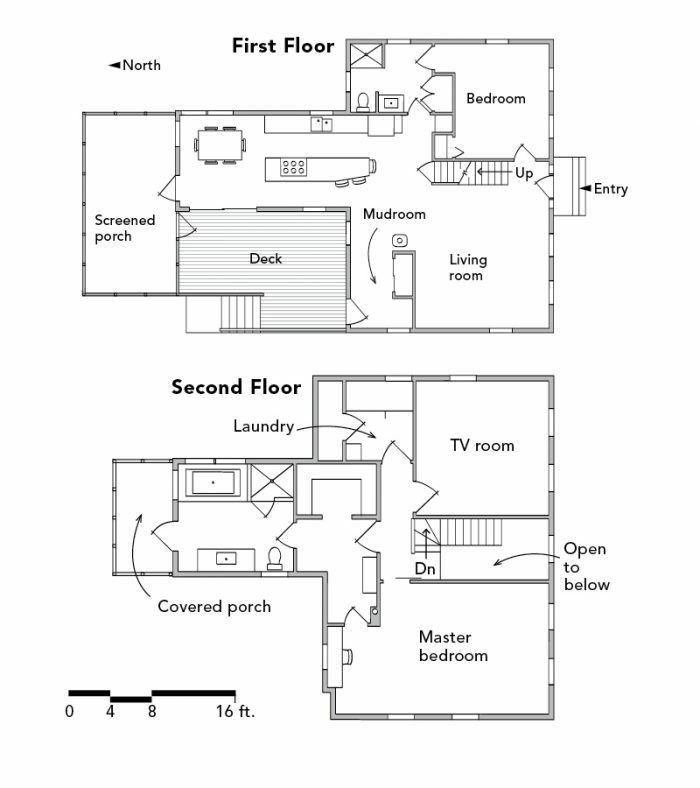 The extended opening means that the living room is not only open to the entryway, but it is also more open to the kitchen, which straddles the original home and the additions. 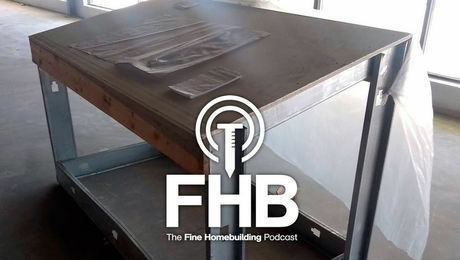 After much discussion, we all agreed that it would be best to be transparent about the changes we were making to the home and keep the steel exposed. Daniel and Vincent are avid cooks, so an efficient working kitchen was essential. 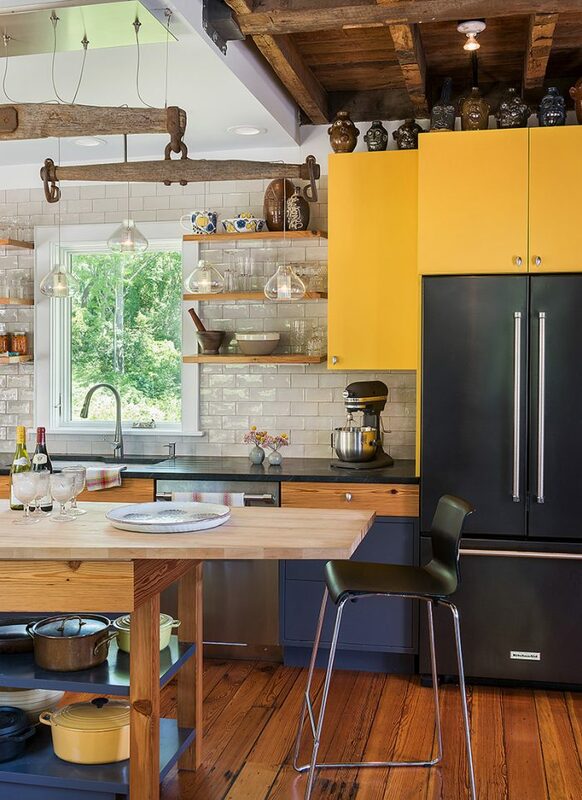 A butcher-block island and soapstone counters at the sink were non-negotiable starting points. The 36-in. Thermador cooktop and downdraft ventilation system, extra-large wall oven, and French-door refrigerator were also must-have, big-ticket items. The custom-width island maximizes storage and workspace in the long narrow kitchen, and the homeowners splurged on the antique yoke chandelier, which reminded them of something they had seen in their travels. We worked with the folks at Tech Lighting, from whom we bought much of the other lighting in the house, to make this custom fixture. 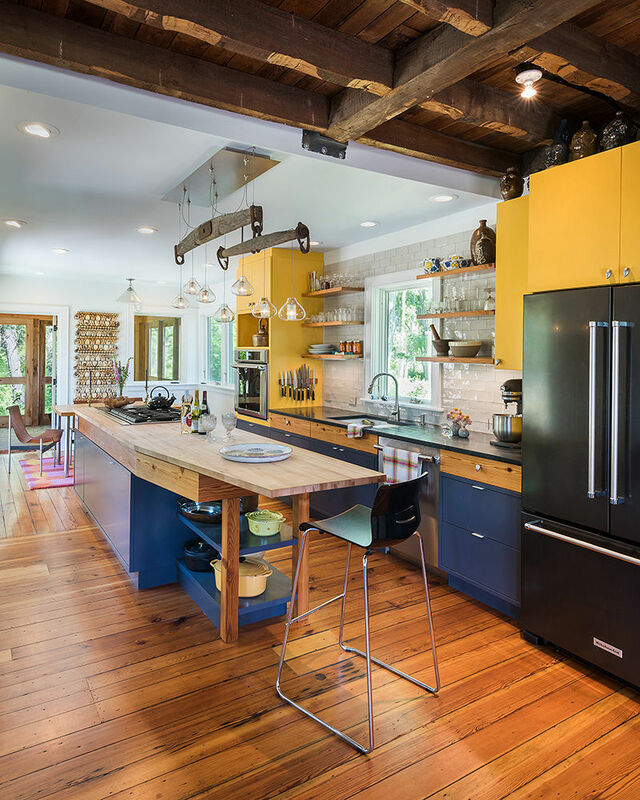 Heart pine floors and drawers and French-inspired yellow paint for the cabinets are a few of the details that personalize the kitchen. Elements like the stairway, flooring, windows, siding, and trim are often replaced during extensive remodels like this. Keeping them in place not only maintains character, but it keeps costs down. 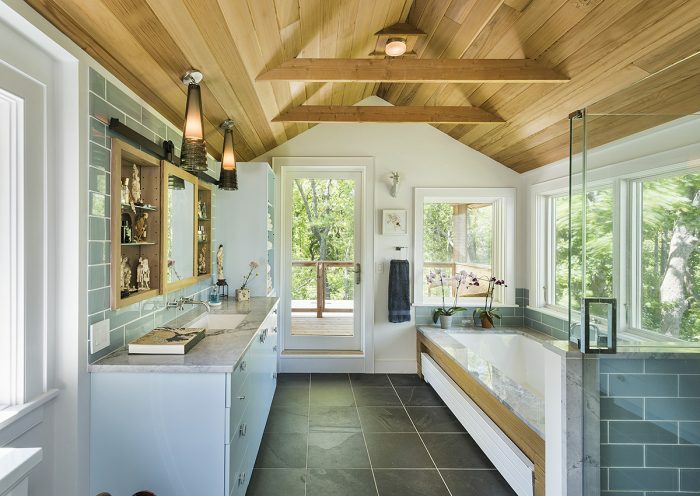 With a vaulted cedar ceiling and large windows, the master bath has a porchlike feel, and actually opens to a covered second-story porch on the back of the house. 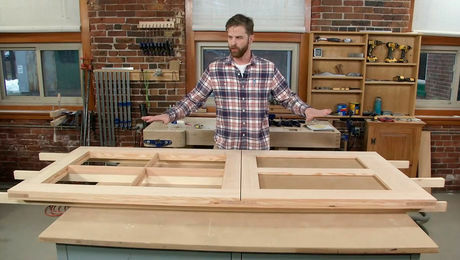 The custom medicine cabinet has a barn-door-style mirror and is flanked by display shelves. Beneath the tub surround, the designer tucked the bath’s electric baseboard heater. 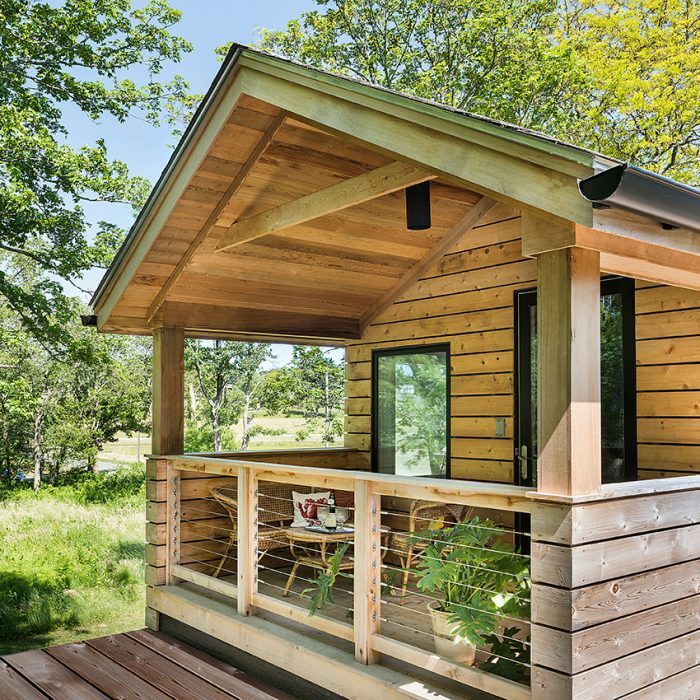 The porch is just big enough for a few people to enjoy at one time, so it made sense to connect it to one of the most private spaces. While this aspect of the remodel is admittedly a bit bizarre, it actually works quite well for Daniel and Vincent. For one thing, we had 20 ft. under the addition roof for the master bath, which, had we used it all, would have been unnaturally long. Also, the best views are to the north, behind the house. The middle section of cable railing on the bathroom porch is designed to be removed for access to the flat roof over the screened porch below. This design is meant to help with maintenance, but will also serve a plan to transform the flat roof into a full second-story deck in the future. This house required quite a bit of structural work. In many places we had to reframe walls, sister joists and rafters, and generally shore up a lot of the old structure. Our intentions were always to do our best to work with what was there and to reuse materials as much as possible. Outside the master suite, we reworked the second-floor circulation by moving the door to the second bedroom and eliminating a good portion of the hall. Tucked under the roof on the second floor, the new master bedroom works because we added a small shed dormer and vaulted the ceiling. 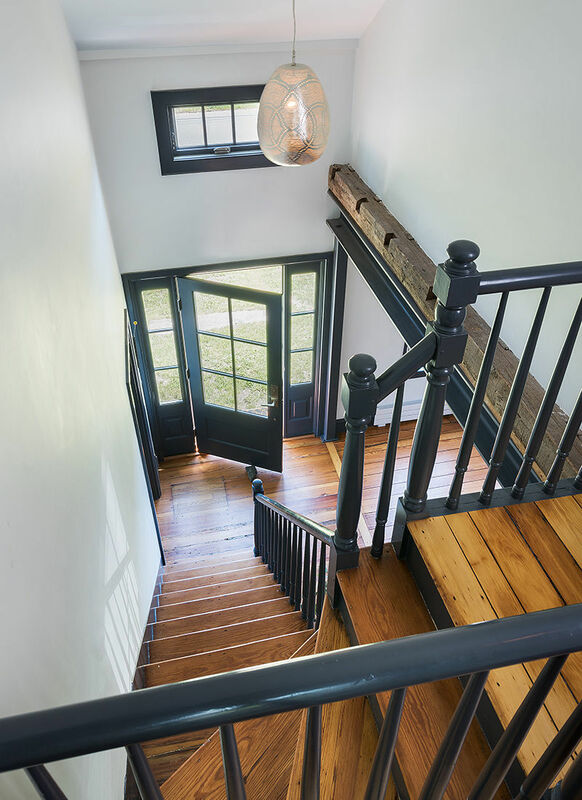 Since they were going to be exposed, and we were trying to keep as much traditional character in the original part of the house as possible, we chose to use original 3×6 framing lumber taken from other parts of the house for the rafter ties. 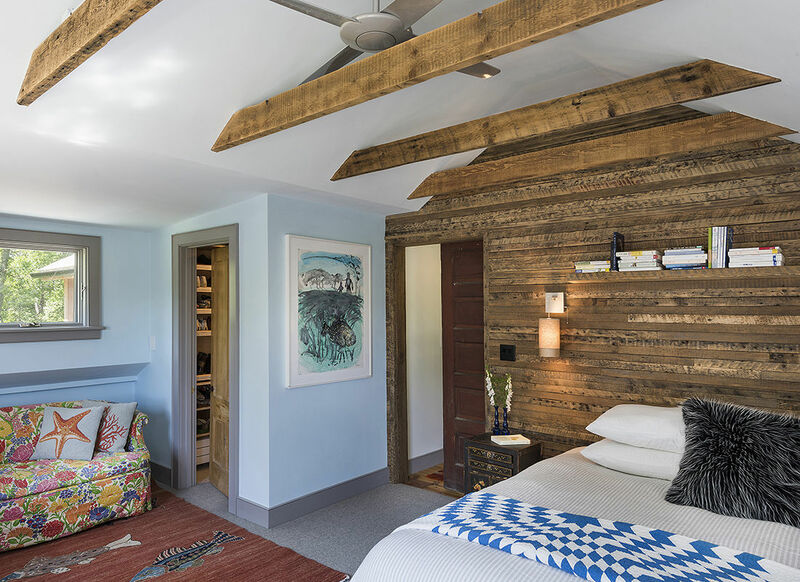 The paneled headboard wall is also made from material reclaimed from the project. 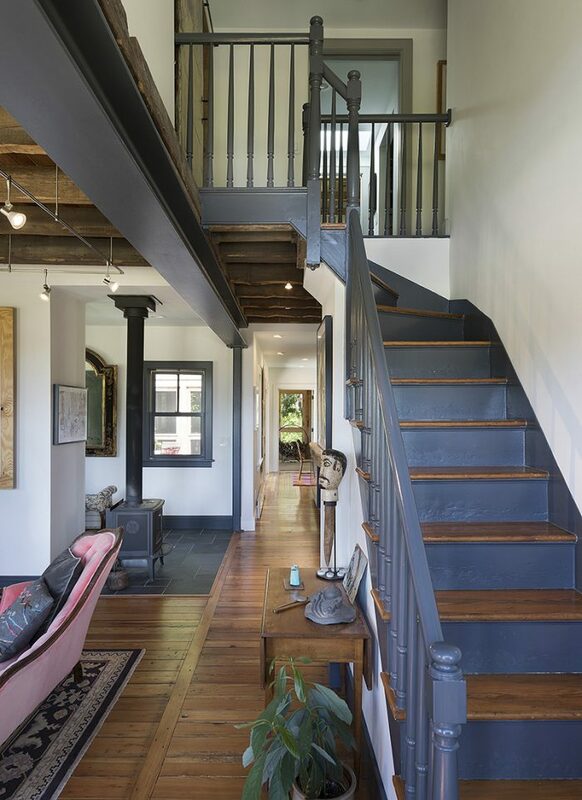 The 2x3s were carefully milled into paneling to preserve their aged charm. Though we stripped and refinished the original heart-pine floors throughout most of the house, we installed wool carpet in the bedroom. Wanting to leave open the living room ceiling below, the carpet closes gaps in the floor boards to keep stuff from falling through, offers privacy, and even helps to deaden sound. Architectural photos by Nat Rea. Before photos courtesy of the author. Floor-plan drawings by Patrick Welsh.